Emerald Chronometer is designed to be a realistic depiction of a mechanical watch on an iPhone. Considerable care has been taken to avoid displaying things that are physically impossible, to enhance the illusion that you're looking at a real mechanical time piece. 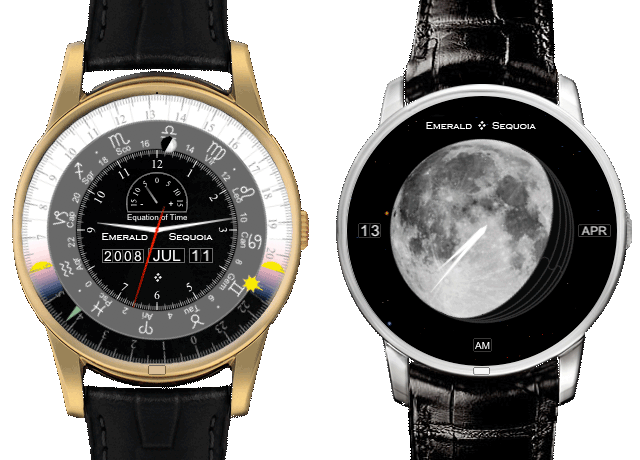 For example, the moon phase display on the watch named Chandra (above right), while considerably more realistic than a typical moon-phase clock or watch (because it shows the correct shape for all phases), is implemented with leaves that move to cover the display rather than simulating a picture. And the black-and-white day/night indicators in the watch named Mauna Kea (above left) are implemented as white ring-segments that rotate into place over the black background. If you look closely you can see the faint borders of these segments move as you press and hold down over the date window with the crown disengaged (you may need to move the hands out of the way first). You'll see examples of this throughout the application. Pieces on watches don't move without some visible means of support, and date wheels slide into place instead of just flashing to their new number. The watches are designed to have the look and feel of something actually mechanical. Of course, Emerald Chronometer has no gears behind the covers turning those wheels and hands. A real mechanical watch implementing Mauna Kea would be on par with, if not more complicated than, the most complicated watches available today. Real mechanical watch designers live in a much different world, and the authors of Emerald Chronometer have great respect for the miracles they are able to accomplish with microscopic mechanical parts. Further, Emerald Chronometer has access to two things mechanical watches don't, an accurate time source (atomic clocks via the Internet) and accurate location data (from the iPhone's Location Services). So Emerald Chronometer is somewhat of a hybrid: a simulation of a mechanical machine which, under the covers, does a bit of the impossible. It's a magic trick in reverse, if you will, where the bit that seems impossible is behind the curtain instead of in front of it. The authors hope you enjoy the effect.